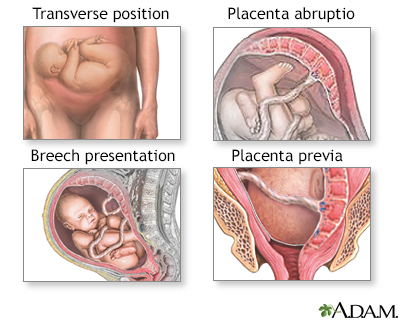 Most women will remain in the hospital for 2 to 3 days after a cesarean birth (C-section). Take advantage of the time to bond with your new baby, get some rest, and receive some help with breastfeeding and caring for your baby. After the excitement of finally delivering and holding your baby, you may notice just how tired you are. Your belly will be painful at first, but it will improve a lot over 1 to 2 days. Some women feel sadness or an emotional letdown after delivery. These feelings are not uncommon. DO NOT feel ashamed. Talk with your health care providers and partner. Breastfeeding can often begin right after surgery. The nurses can help you find the right position. Numbness from your anesthetic can limit your movement for a while, and pain in your cut (incision) can make it a little harder to become comfortable, but do not give up. 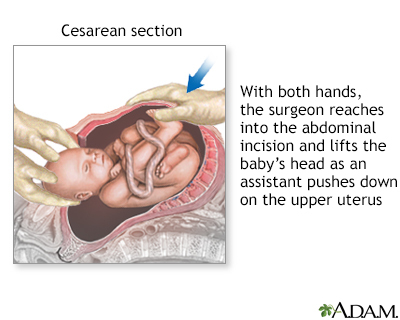 The nurses can show you how to hold your baby so there is no pressure on your cut (incision) or abdomen. Holding and caring for your new infant is exciting, making up for the long journey of your pregnancy and the pain and discomfort of labor. Nurses and breastfeeding specialists are available to answer questions and help you. Also take advantage of the babysitting and room service the hospital provides for you. You are going home to both the joys of being a mother and the demands of caring for a newborn infant. Between feeling exhausted after labor and managing the pain from the surgery, getting out of bed may seem like too big of a task. But getting out of bed at least once or twice a day at first can help speed your recovery. It also decreases your chance of having blood clots and helps your bowels move. Make sure someone is around to help you in case you get dizzy or weak. Plan on taking your walks soon after you have received some pain medicine. Once you deliver, the heavy contractions are over. But your uterus still needs to contract to shrink back to its normal size and prevent heavy bleeding. Breastfeeding also helps your uterus contract. These contractions may be somewhat painful, but they are important. As your uterus becomes firmer and smaller, you are less likely to have heavy bleeding. Blood flow should gradually become slower during your first day. You may notice a few smaller clots passing when the nurse presses on your uterus to check it. Your epidural, or spinal, catheter can also be used for pain relief after surgery. It may be left in for up to 24 hours after delivery. If you did not have an epidural, you may receive pain medicines directly into your veins through an intravenous line (IV) after surgery. This line runs through a pump that will be set to give you a certain amount of pain medicine. Often, you can push a button to give yourself more pain relief when you need it. This is called patient controlled analgesia (PCA). You will then be switched to pain pills that you take by mouth, or you may receive shots of medicine. It is OK to ask for pain medicine when you need it. You will have a urinary (Foley) catheter in place right after surgery, but this will be removed on the first day after surgery. The area around your cut (incision) may be sore, numb, or both. Sutures or staples are often removed around the second day, just before you leave the hospital. At first you may be asked to only eat ice chips or take sips of water, at least until your provider is certain you are not likely to have very heavy bleeding. Most likely, you will be able to eat a light diet 8 hours after your C-section.